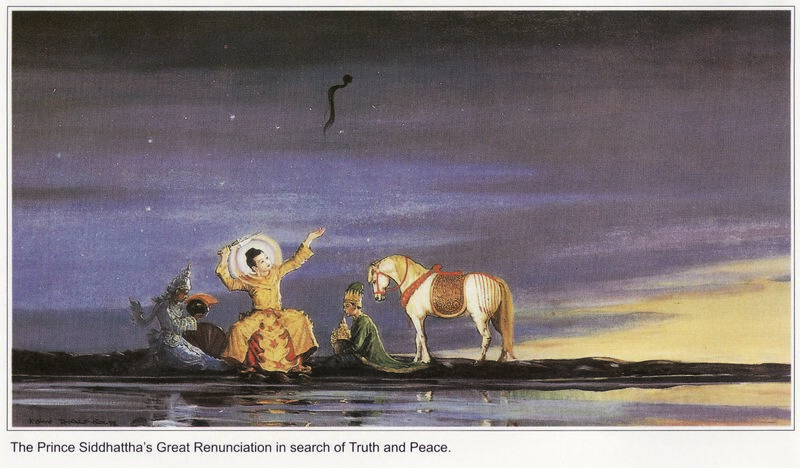 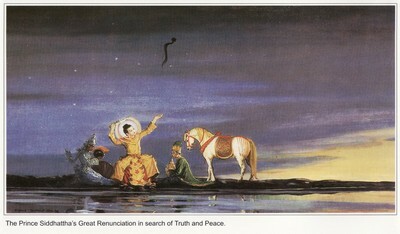 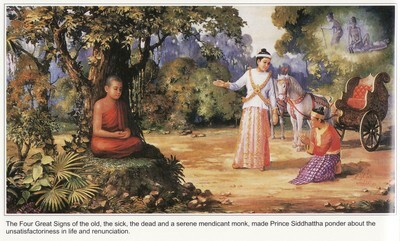 SUMEDHA, the wise man inherited a vast fortune from his parents who left them upon their deaths. 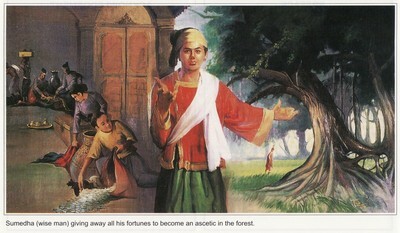 Realizing the unsatisfactoriness he gave away his fortune and became an ascetic in the forest. 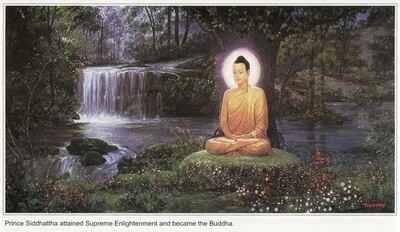 He soon gained mastery in meditation and was well known for his supernormal powers. 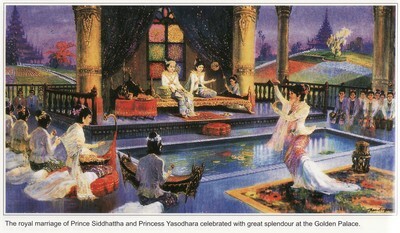 Mara (the Evil One), with his host tried without success to prevent Prince Siddhattha from his Great Renunciation at midnight . 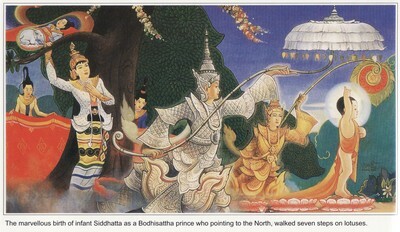 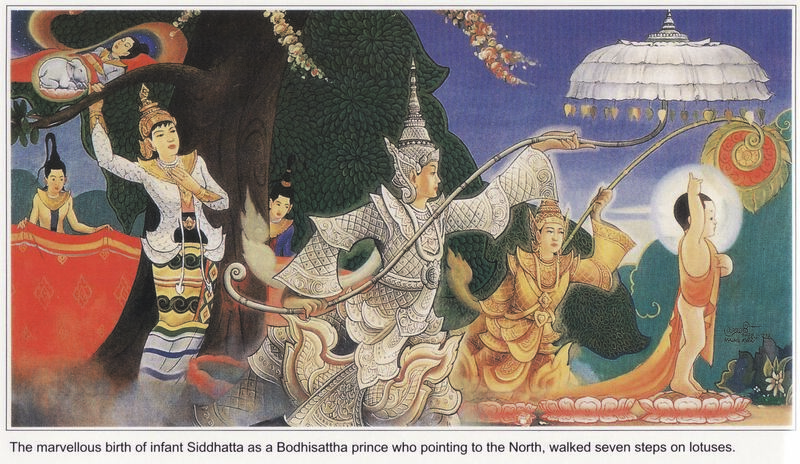 Prince Siddhattha was riding on Kanthaka his fovourite stallion and followed by Channa his loyal charioteer. 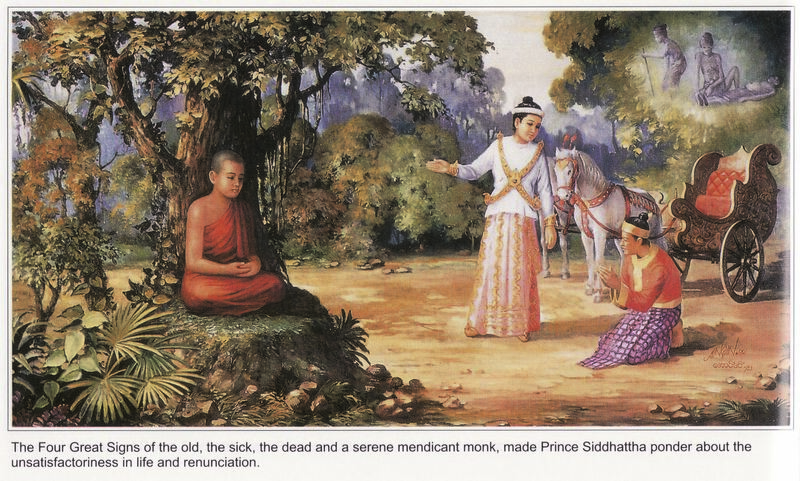 Mara said that if the prince did not proceed on his renunciation, he would become a Universal Monarch on the seventh day. 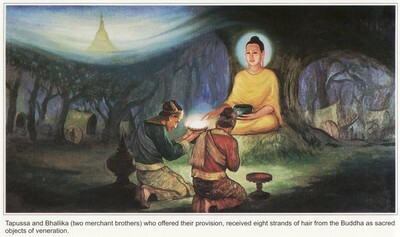 His hair was received by Sakka, King of Gods and enshirned in CULAMANI CETI (pagoda) in his celestial abode in TAVATIMSA. 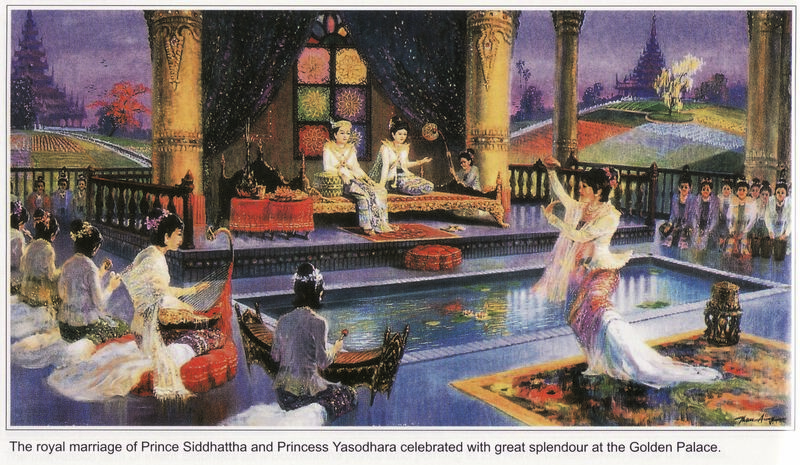 Similarly, Ghatikara Maha Brahma bore his princely clothes to his higher celestial abode, Akanittha and enshrined them in the pagoda known as DUSSA CETI. 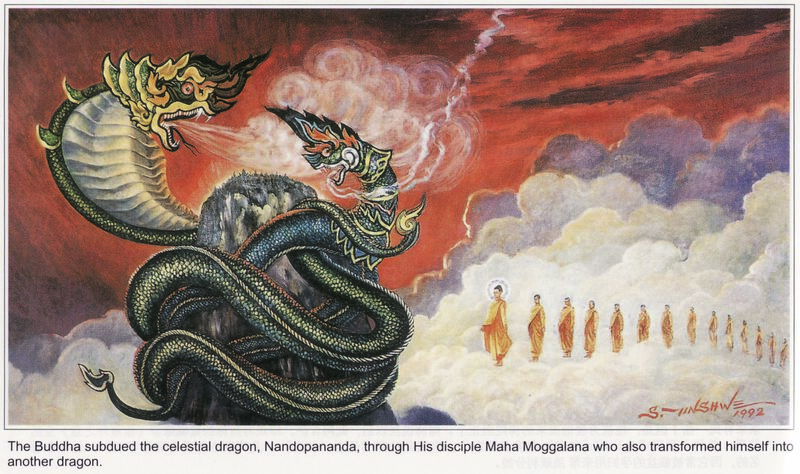 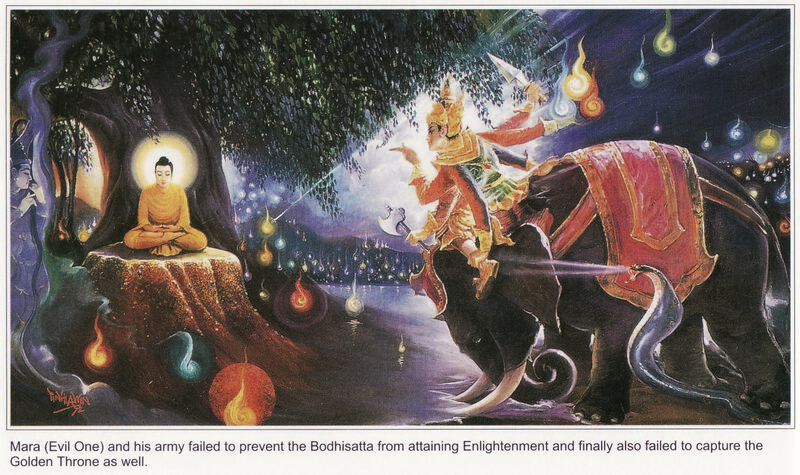 The Bodhisatta was sitting on a Golden Throne under a Bodhi tree and being challenged by Mara (the Evil One) riding on the ferocious elephant Girimekhala. 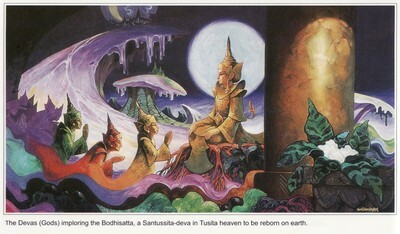 Mara with host tried to capture the Golen Throne just before the Bodhistta’s Enlightenment. 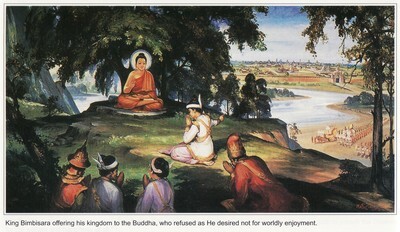 On Vesakha Full Moon day, Bodhisatta Siddhattha seated under a Bodhi tree at Gaya, attained Supreme Enlightement. 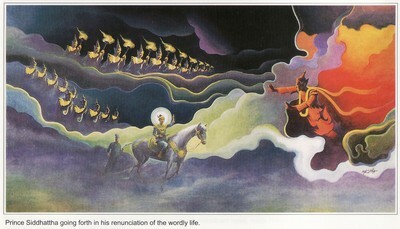 On the first watch of the night he gained knowledge by which He remembered past lives. 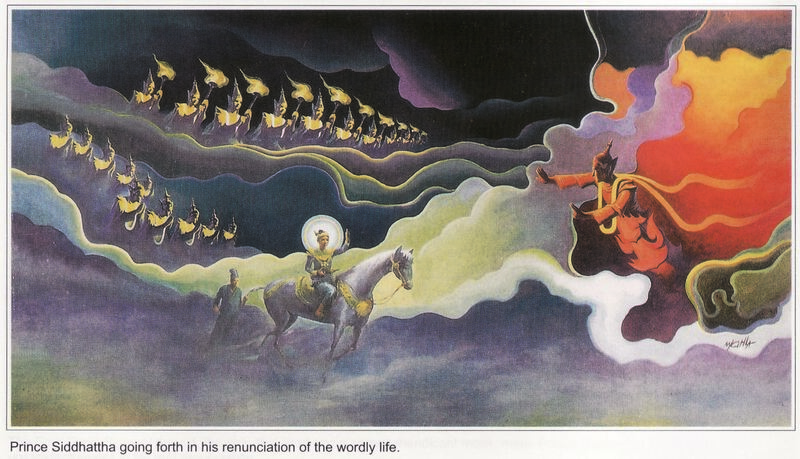 On the second watch of the night he was able to see into the future including the birth and death of other beings. 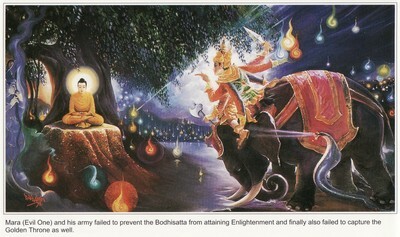 On the third watch of the night, He destroyed all defilements and became a Fully Enlightened One (Samma-Sambuddha). 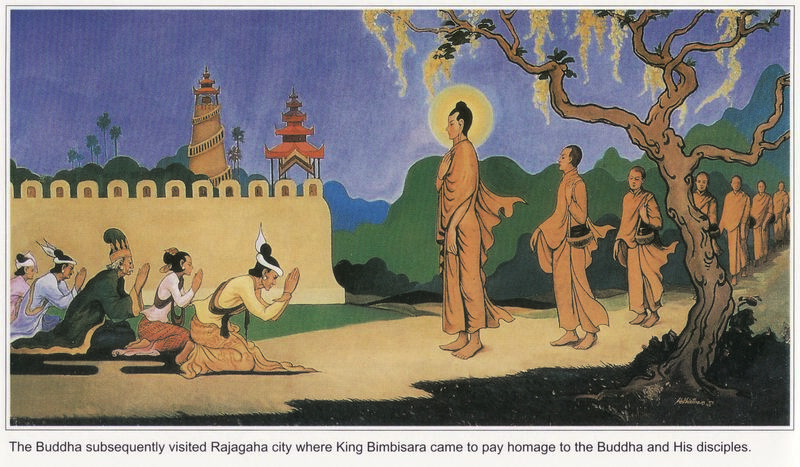 It was in the final week (7th week) after his Enlightenment, when the two merchant brothers Tapussa and Bhallika from Ukkalapa passed by the spot and saw the Buddha. 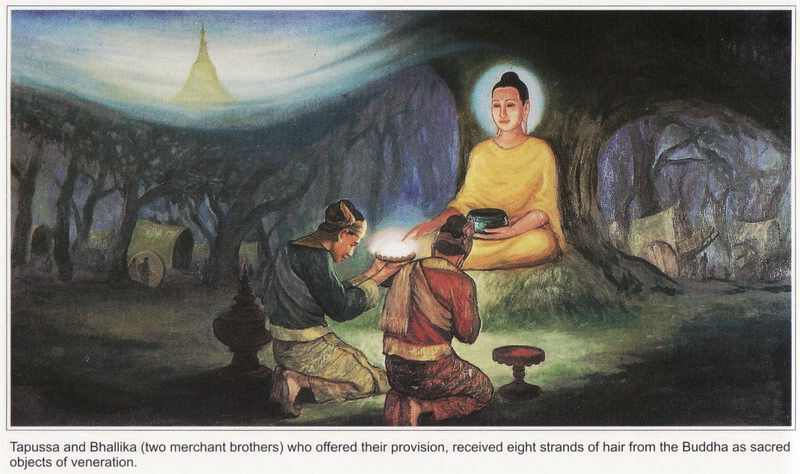 They offered the Buddha their own provision; then the Buddha gave eight strands of hairs from His head for them to worship as sacred objects of veneration.The hair relics are now enshrined in the Shwedagon Pagoda in Yangon, Myanmar. 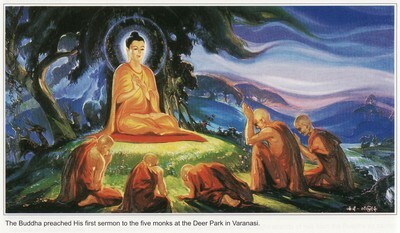 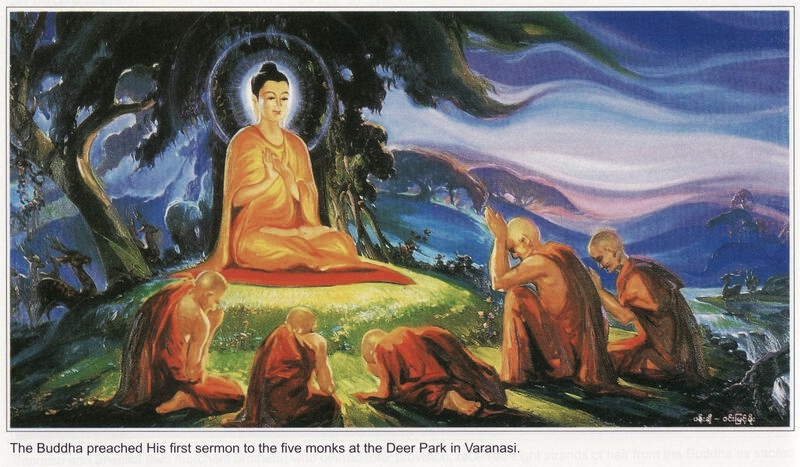 At the Deer Park at Varanasi, the Buddha met the five ascetics, Kondanna, Vappa, Bhaddiya, Mahanama and Assaji all of whom He had known before .He delivered His first sermon to them. 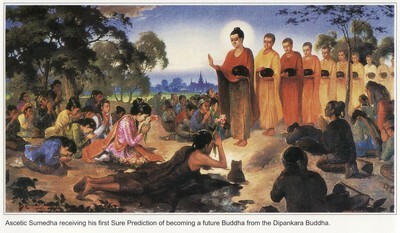 It is called the Dhammacakkapavattana Sutta which sets the wheel of the Dhamma in motion. 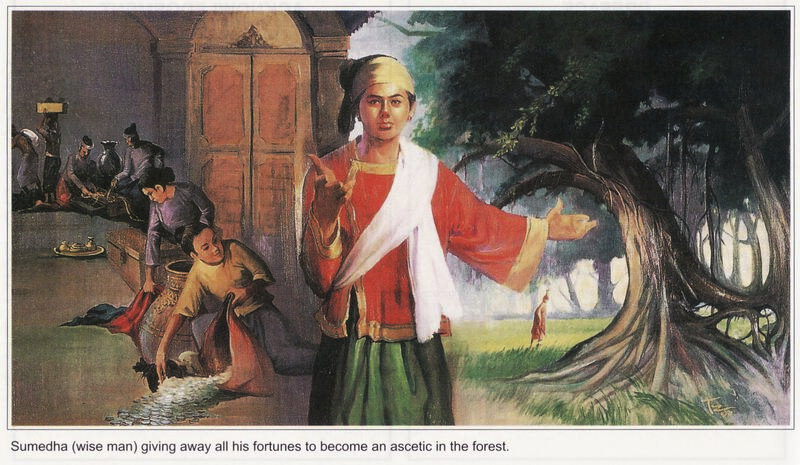 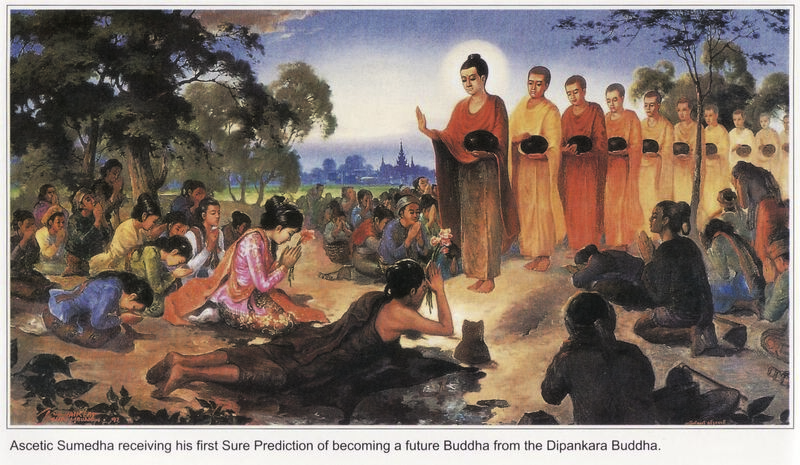 The ascetic Kondanna who was at His childhood Name-giving Ceremony became the first to see light in the Dhamma and attained Sotapanna, the first stage of Sainhood. 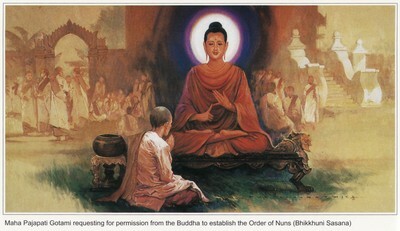 The Order of Nuns (Bhikkhuni Sasana) was founded in the fifth year of the Buddha’s Enlightenment. 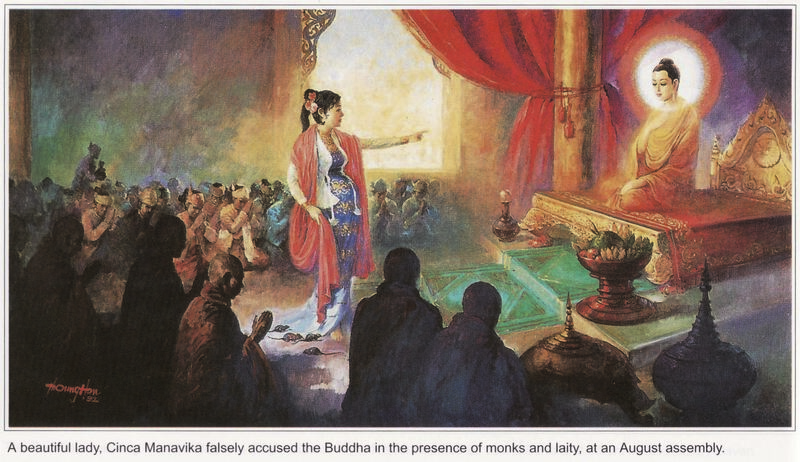 After the death of King Suddhodana, Maha Pajapati Gotami , who was His former foster mother desirous of joining the Order ,approached the Buddha who was then, residing at Kapilavathu and begged permission for women to be admitted into the Order. 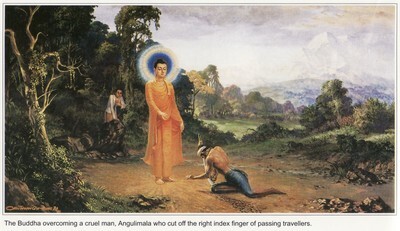 After hearing and turning down their pleas, Buddha returned to Vesali for the Rains Retreat . 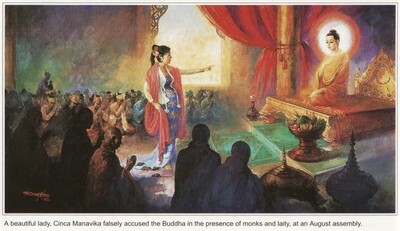 Undaunted by the rebuff, Maha Pajapati Gotami cut off her hair and wearing yellow garments went on foot to Vesali, accompanied by many other Sakyan ladies. 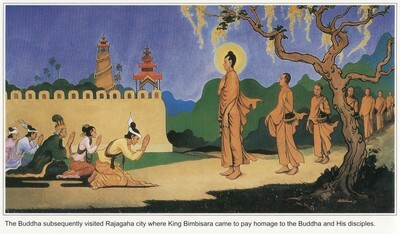 They stood outside the porch of the Pinnacled Great Hall in Mahayana where the Buddha was residing. 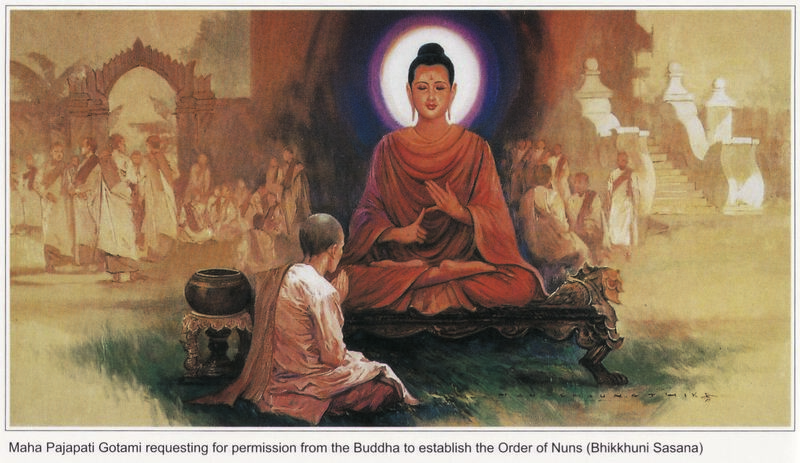 Interceded by Venerable Ananda , the Buddha finally consented to establish the Bhikkhuni Sasana when Maha Pajapati Gotami and other Sakyan ladies agreed to observe the Eight Disciplinary Rules for nuns. 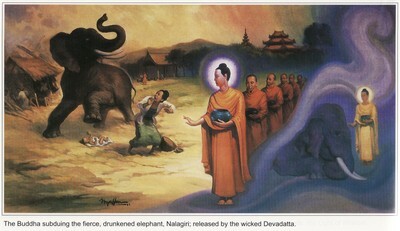 Henceforth Maha Pajapati Gotami and other Sakyan ladies were admitted into the Order. 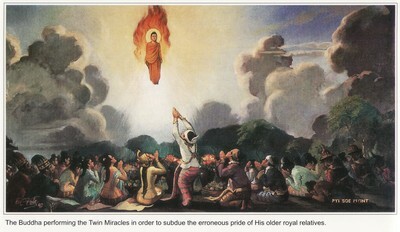 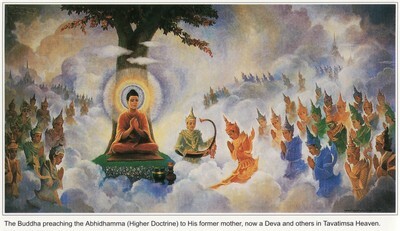 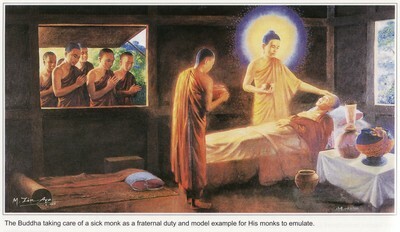 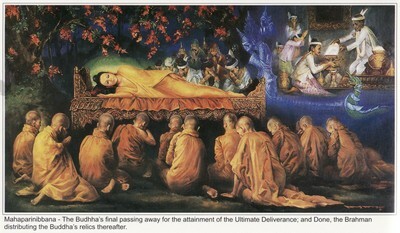 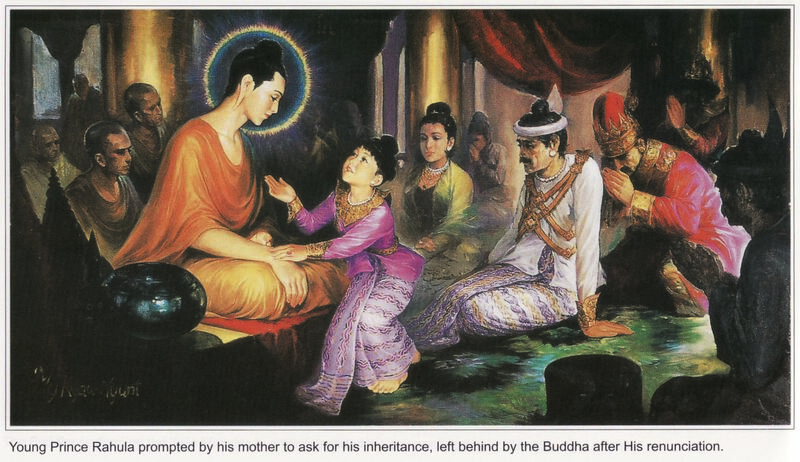 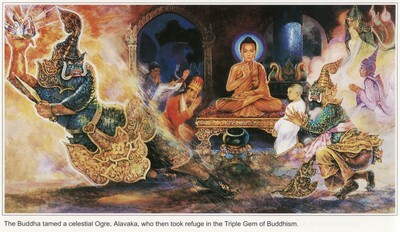 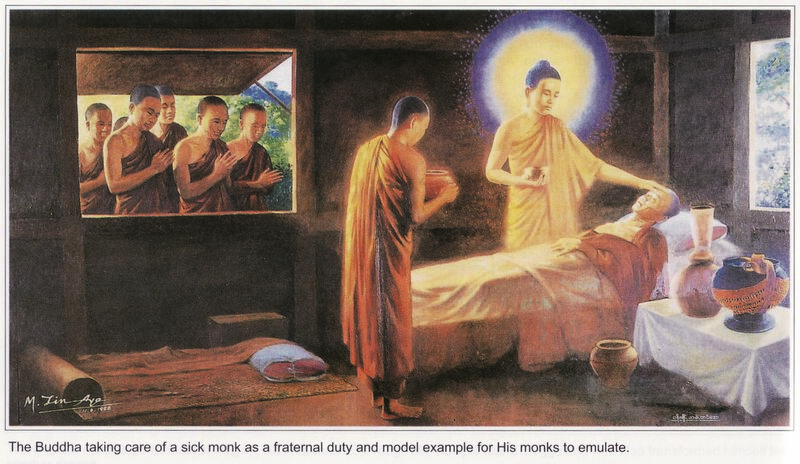 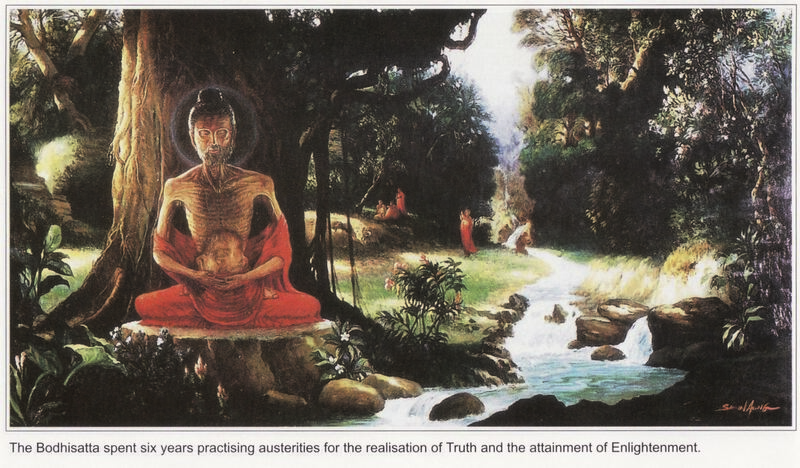 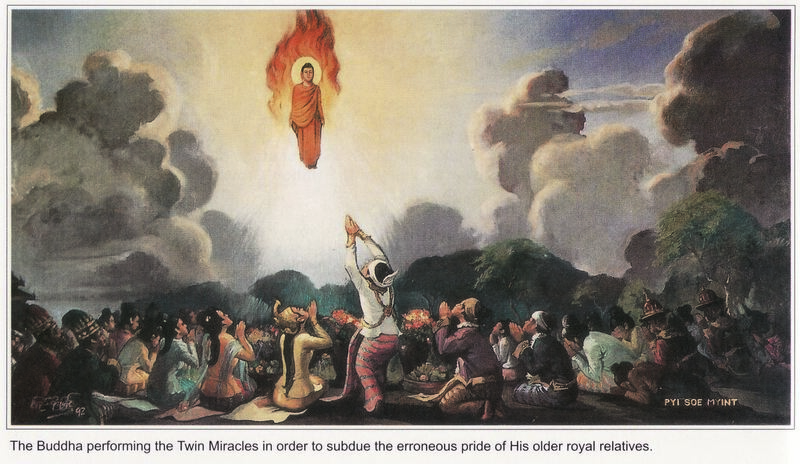 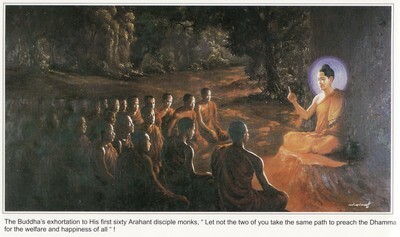 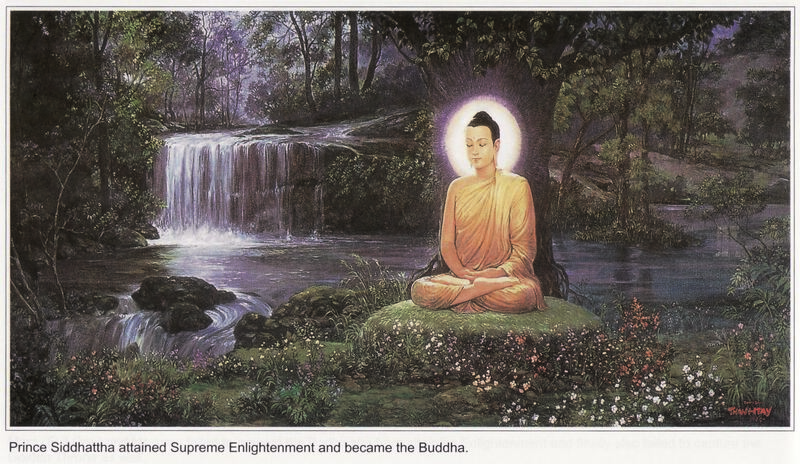 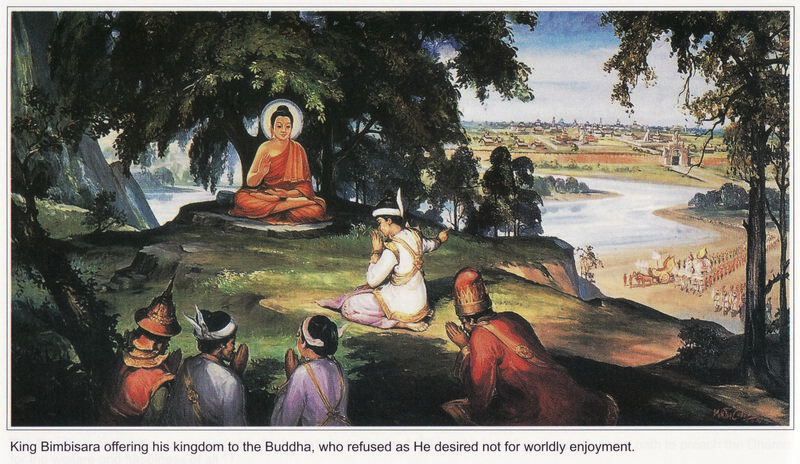 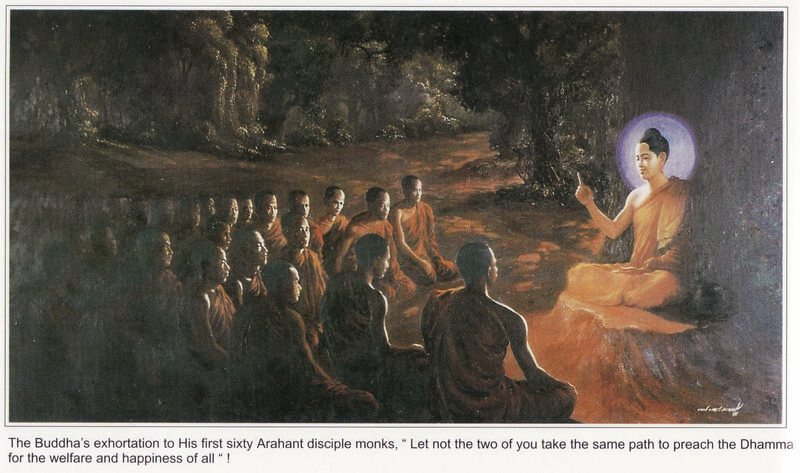 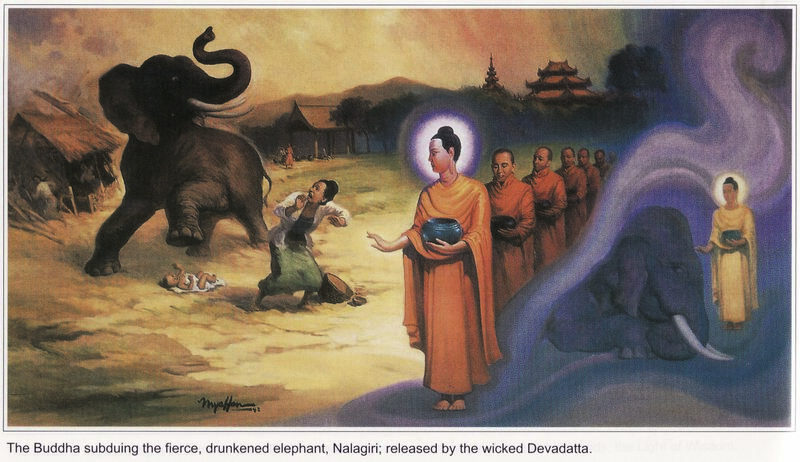 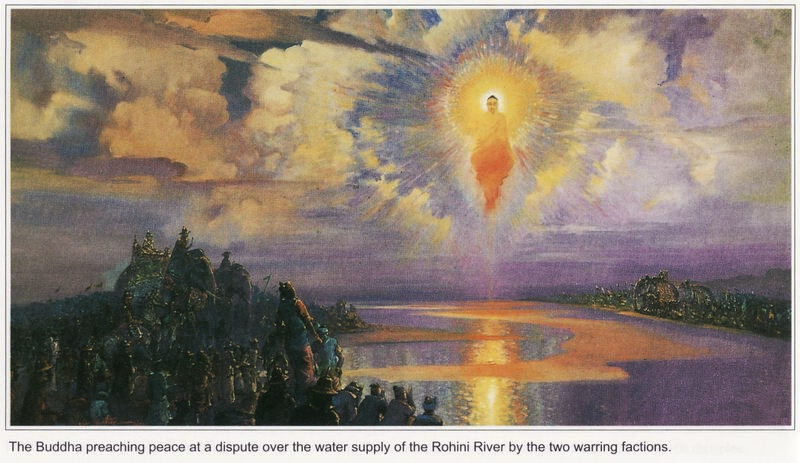 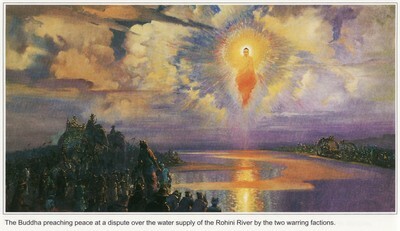 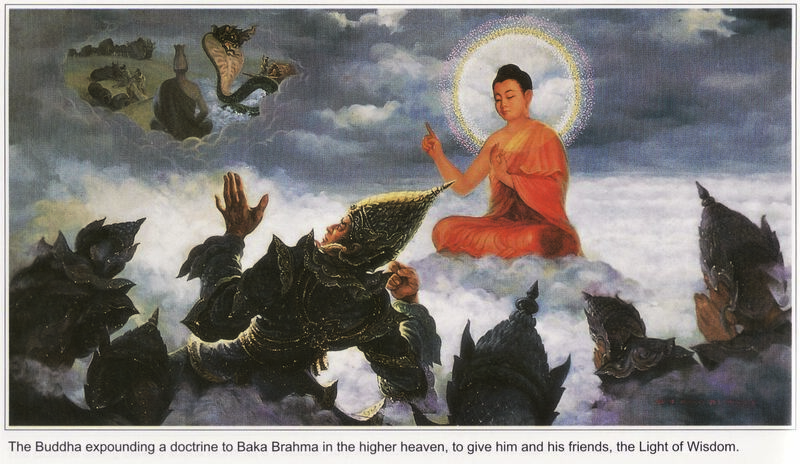 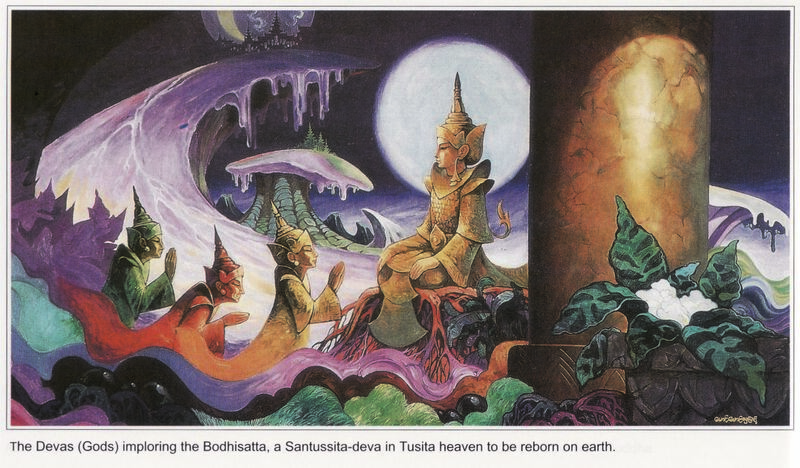 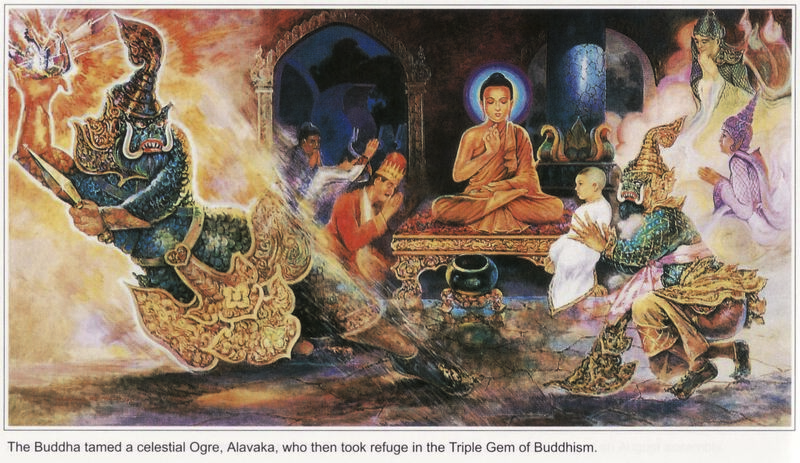 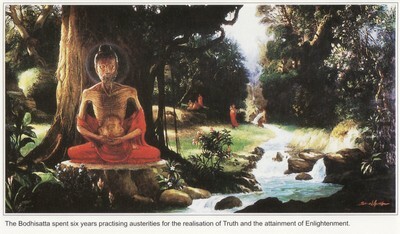 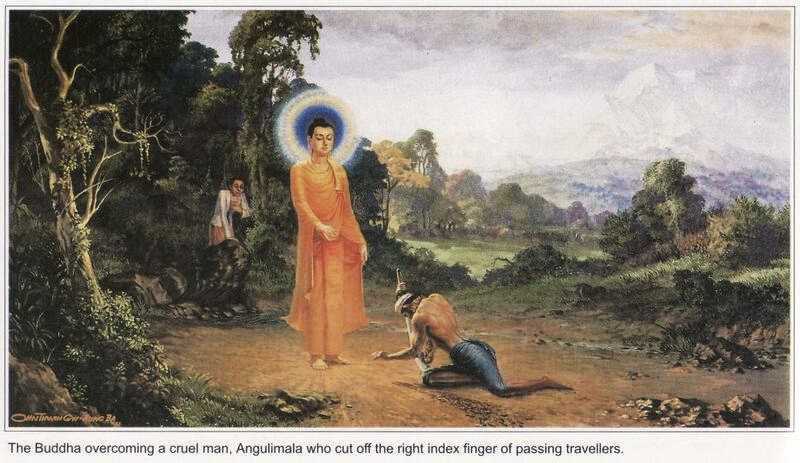 On the seventh year after His Enlightenment, the Buddha preached the Abhidhamma (higher Doctrine) in Tavatimsa Heaven. 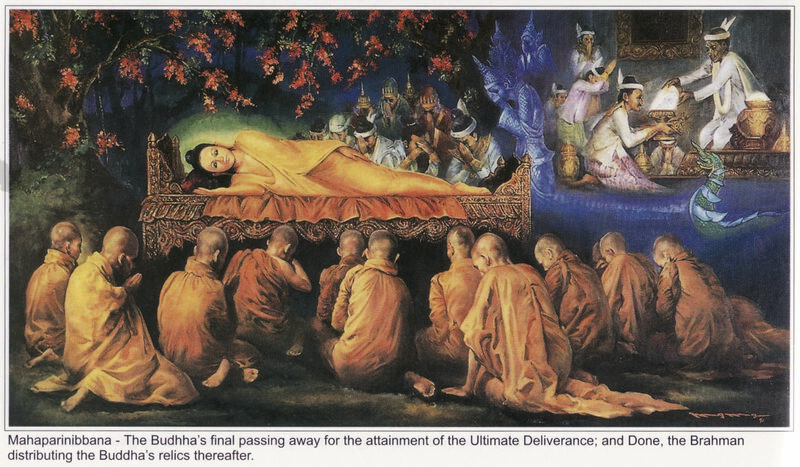 As a fulfillment of gratitude to his former mother, now a Santussita deva, the Buddha then delivered a sermon on the Higher Doctrine to thousands of Devas (Gods) and Brahmas (higher celestial beings) who attained the various stages of Noble Sainthood. 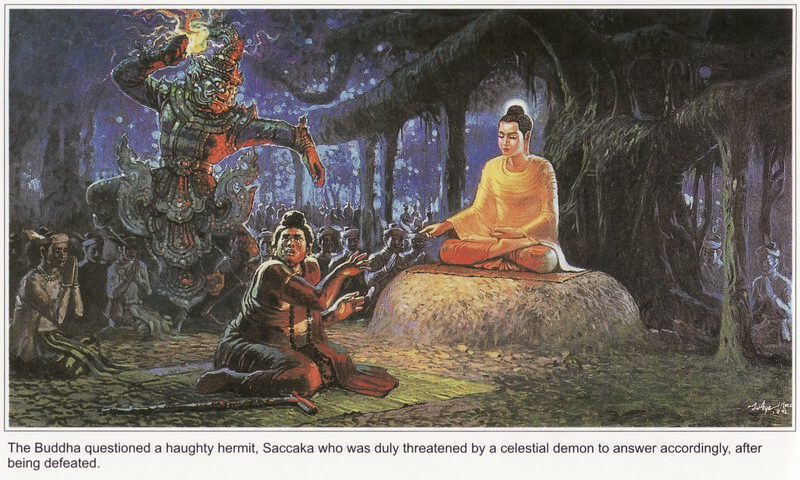 On the sixteenth year of His Enlightment, the Buddha tamed the carnivorous Demon King , Alavaka who feasted on human flesh, to give up his habit on devouring at least one human being everyday. 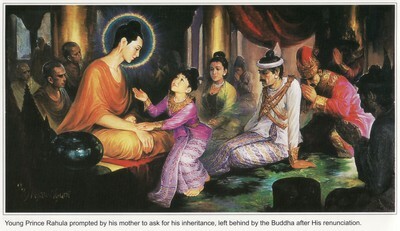 After hearing the Buddha’s Teaching, he henceforth gave up his habit, thus sparing the small child offered to him as food on that day. 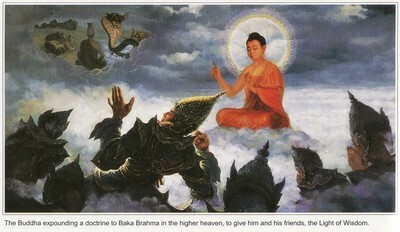 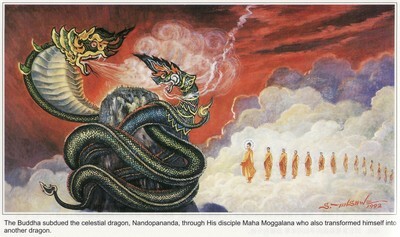 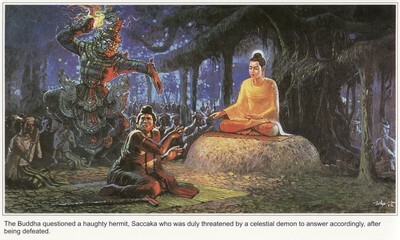 Baka Brahma, who was bitten by the snake of tenacious heresay (in believing that the Brahma Loka is the best and everlasting world in existence) , was duly defeated by the Buddha in a mutual contest to show power. 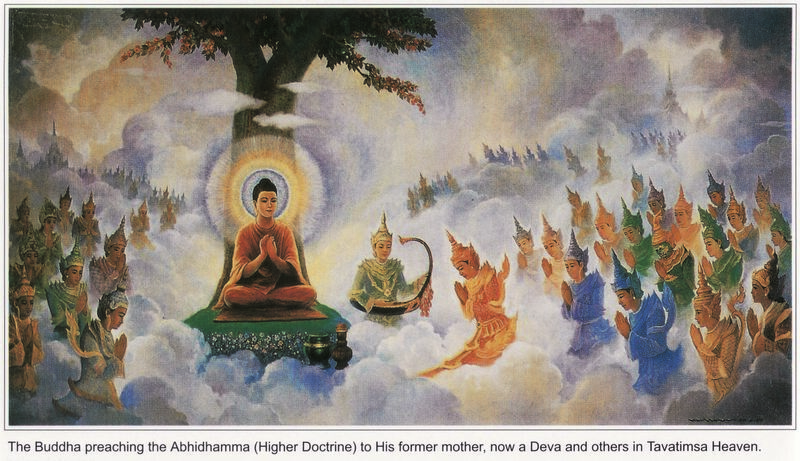 On hearing the Buddha’s profound expounding of the Dhamma (Buddhist Doctrine), he became enlightened along with many other Brahmas (higher celestial beings).